Pool days are the best days, but then again so are spa days. So what if you could have both? Adding a hot tub or spa area to your pool build might put extra pressure on your wallet, but can be the perfect choice for you and your family. Besides the simple relaxation element of a hot tub, there are also a lot of physiological benefits that are gained from soaking your tired body. Here are some factors you should consider during the decision-making process, as well as some of the physical benefits of having 24/7 access to a hot tub. –What is my budget? 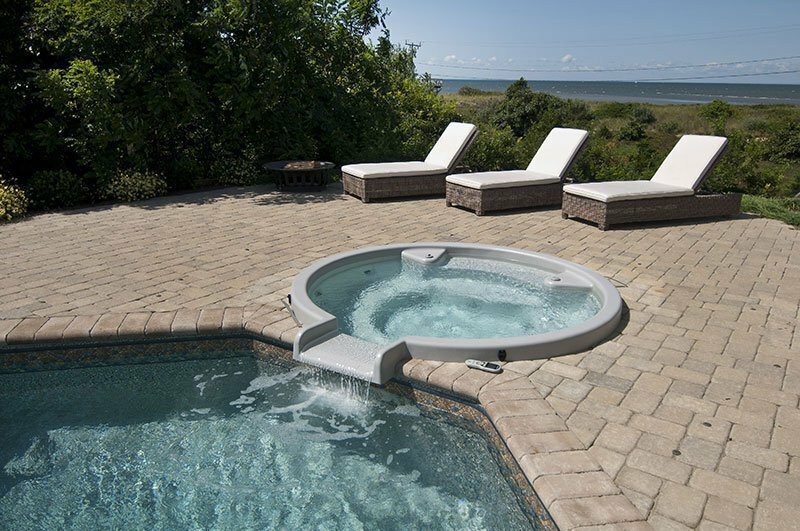 The average hot tub with installation costs anywhere between $7,000 and $30,000 depending on the style and design. –Can I commit to the maintenance or should I hire an expert? Hot tubs need regular monitoring for water sanitary, balancing of pH, alkalinity, and other levels. Makeup, perfumes and other cosmetics can negatively affect the water balance and lead to foam and cloudiness (a quick shower before anyone jumps in the hot tub is always a good idea). Also remember that flushing the water lines once a year is required and the tub water will need to be replaced every three or four months. –Location, location, location. Is there a proper place in your build to include a hot tub? Considering the aesthetics of the unit is quite possibly the most important part of the decision. No one wants a spa area that ends up being an eye sore. – Your heart works harder when exposed to the heat and circulation improves. -According the Arthritis Foundation, the warmth and buoyancy of warm water is a safe, ideal environment for relieving arthritis pain and stiffness. -Jet nozzles add a massage element to the water therapy and helps relax tight muscles. -Regular hot tub has been found to lower high blood pressure due to stress. If you’re considering adding a spa area to your backyard oasis, give our team the opportunity to answer all of your questions by calling 508-432-3445 or emailing info@shorelinepoolsinc.com. Consider us your relaxation experts!